The meat marketing website, MeatSuite.com, has expanded to the NWNY region and beyond. MeatSuite.com is a free online directory of regional livestock farms selling meat in bulk quantities. 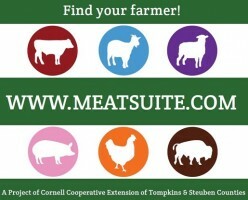 MeatSuite is a project of Cornell Cooperative Extension Tompkins and Steuben Counties to promote direct, local, meat sales is currently funded by the New York Farm Viability Institute. Efforts are underway right now to recruit farmers to the site. After doing some searches I see there are already some farms in our region on the site. Good for you! More information will be in December's Agfocus. Information on posting a profile is in the attached pdf.